Going beyond previous investigations into urban land use and travel, Petter Næss presents new research from Denmark on residential location and travel to show how and why urban spatial structures affect people's travel behaviour. In a comprehensive case study of the Copenhagen metropolitan area, Næss combines traditional quantitative travel surveys with qualitative interviews in order to identify the more detailed mechanisms through which urban structure affects travel behaviour. The case study findings are compared with those from other Nordic countries and analyzed and evaluated in the light of relevant theory and literature to provide solid, valuable conclusions for planning sustainable urban development. 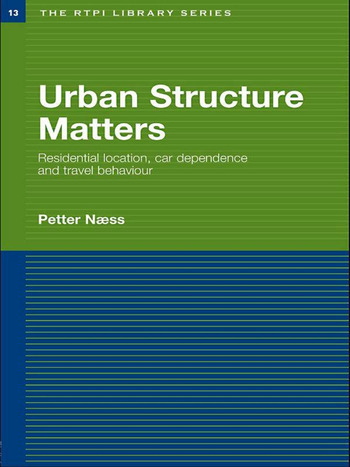 With a broader range of statistics than previous studies and conclusions of international relevance, Urban Structure Matters provides well-grounded conclusions for how spatial planning of urban areas can be used to reduce car dependence and achieve a more sustainable development of cities.